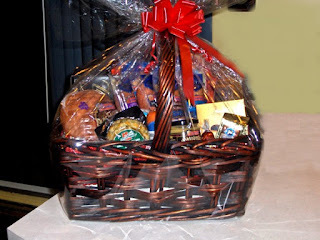 Building your own holiday gift baskets gives you more options than purchasing a pre-made basket. All you need is a basket big enough to hold your selected items, items to put within the basket, plastic wrap, filler for the bottom of the basket, and some kind of ribbon to tie it all together. What are his or her preferences? What does he or she like to do? Does he or she prefer to be outdoors or inside? Prefer to play sports games or watch sports games? Sing? Read? Write? Draw? Paint? The answers to these questions should give you some ideas what to put in the basket. Depending on the size of the basket you select, you should have ten to twenty person appropriate items. Suppose you need a gift for a pre-teen girl. After considering the questions above, you determine she likes make up, clothes, Disney characters, movies, purses, volleyball, and Wii. For this basket, you might select an assortment of fingernail polish, a sample of polish remover, an eye shadow collection (be sure this is ok with her parents), a t-shirt with her favorite Disney character on it, the most current Disney DVD, a small purse, a volleyball bracelet, and the Volleyball for Wii game. When you begin to assemble the gift, you will need a filler for the bottom of the basket. In this instance, a yard of pink or purple tulle would work well. With tulle in the bottom of the basket, arrange the gift items with the most important in the center. A few artificial flowers snipped off the stem can be artfully placed for more visual excitement. Other fillers for the bottom of baskets include artificial Easter grass, holiday tinsel garland, or a different appropriate fabric. When the basket is ready, you need to wrap it in plastic. I like to use Reynold's plastic wrap in an appropriate color. Again, for this, pink or purple would work well, and clear wrap works for any occasion. On a large flat surface, place two strips in a cross pattern on the table. Place at least two more strips in another cross pattern, with these strips at an angle where they fit between the points of the first. Basically, you are making an eight pointed star shape. Set the basket in the center where all the plastic strips cross each other. One at a time, gather up the strips to one point above the basket. Use curling ribbon to tie the strips together, then smooth the sides to close any gaps. Gift baskets go over extremely well in almost every situation. Whether you need a holiday gift for a family member, a co-worker, a boss, an employee, or a customer, or a birthday or anniversary gift, a basket is appropriate. These special baskets can be created for almost anyone. Whether you fill it with personal items, such as shaving lotion, aftershave, a razor, and blades for a teen just starting to shave, or cologne, makeup, hair care items, and a scarf for women. You might consider lures, hooks, weights, fishing monofiliament line, sunglasses, snacks, and a cap for the fisherman. For a writer, include colored pens and pencils, blank journals, notepads, a coffee cup, and USB jewelry (pins, pendants, broaches, or keychains). You can find items to fit any peference. 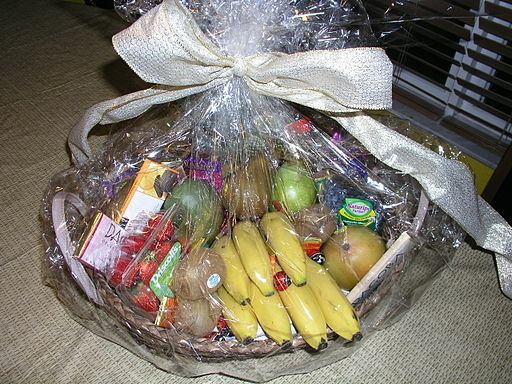 There is no limit to the possibilities, including the standby fruit basket. Unfortunately, we sometimes run out of time and need to purchase a gift instead. Buying online saves time, since we don't have to go to the store, And the best part is that the gift can be delivered anywhere in the world.